Maaaaan...it's been a good month for music coming outta my camp. 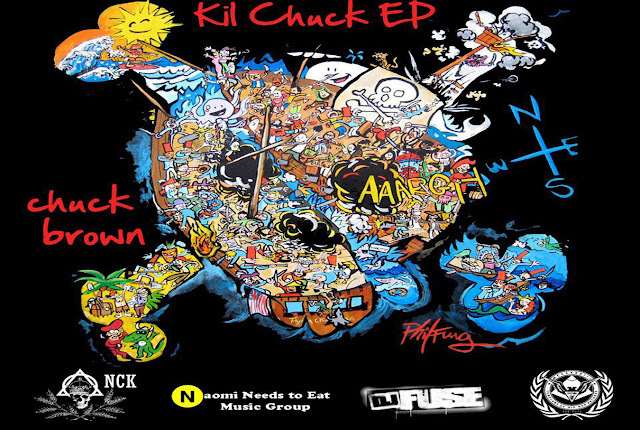 We just dropped Khalim aka K Fanat "Renaissance Musician" EP 2 weeks ago, we premiered his video for "Renaissance Musician" yesterday, me and Vegas just leaked "The Social Network" and today me and my dude Chuck Brown are dropping "The Kil Chuck EP." We dropped our single "Alcoholism" a minute ago (which will be on our album) that got a dope response and if cats we're feeling that jawn TRUST me, you'll love this EP. These are 4 bangers that are fresh out the oven (Chuck JUST recorded them last week and got 'em mixed and mastered this past weekend) that aren't gonna be on the album so slide through his Bandcamp page and cop a FREE download of some REAL dope and VERY personal hip hop. Also check out my dude Phil Fung's (the cat who designed the album cover) website...money is a DOPE artist! KIL!! This beat on Money Tree is FYAH!